I work at the C and O Bicycle Loan Program at Great Falls Tavern as a volunteer mechanic every Sunday. The bicycle program takes donation bikes. One Sunday I go up to the bicycle shed to look over some new arrivals. Amidst the Wal-Mart and K-Mart bikes I see a vintage champaign covered Schwinn Le Tour covered with dirt and cobwebs. 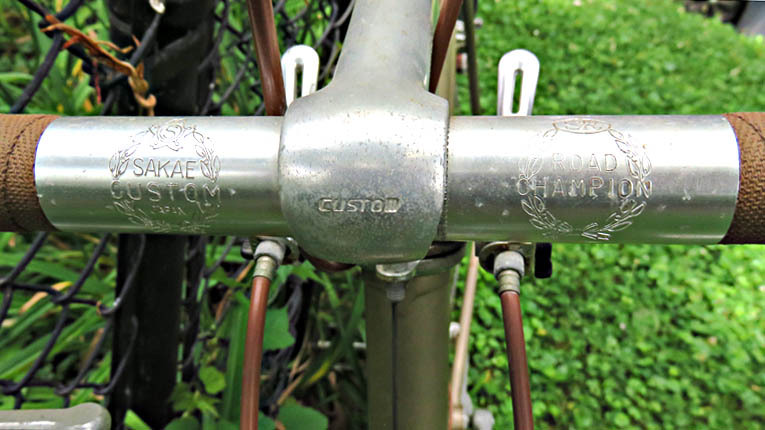 Under the dirt, this Made-in-America Schwinn road bike is in great condition. I surmise it had been ridden a few years during the bicycle boom, and then stored in a garage. After inspecting the Le Tour, I also see that it has all its original parts. I know a bit of the history behind this bicycle, and I decide it's worth the time to restore the Le Tour to its original condition. Despite Schwinn’s reputation as a purveyor of sturdy children’s bikes, this Schwinn Le Tour was a high quality road bike for its time. The 1983 Schwinn Le Tour was a symbolic turning point for Schwinn. The story starts with the introduction of a made-in-Japan Schwinn Le Tour in 1973. The “Schwinn approved” Le Tour first showed up as a new offering in the company’s 1974 catalog. Schwinn decided to give into the stiff competition from Japan and Europe for producing high quality road bikes. With the exception of the Schwinn Paramount, the company had limited capacity to build high quality frames. 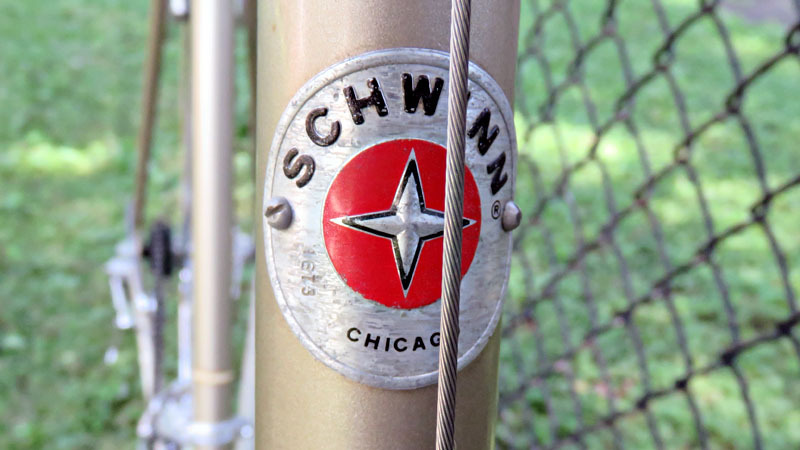 The Schwinn Paramount was built in a small section of the Chicago factory up until 1983. After 1983 the Paramount was made in a small factory in Waterford, Wisconsin. In the 1970s the Chicago factory was hampered by years of a lack of capital investment in new machinery. As a result in 1973 Schwinn hauled up the white flag and outsourced many of its bicycles to Taiwan and Japan. This included the new Le Tour. For about 5 or 6 years the “Schwinn approved” Le Tour was manufactured by Japanese bicycle makers such as Panasonic or Bridgestone. 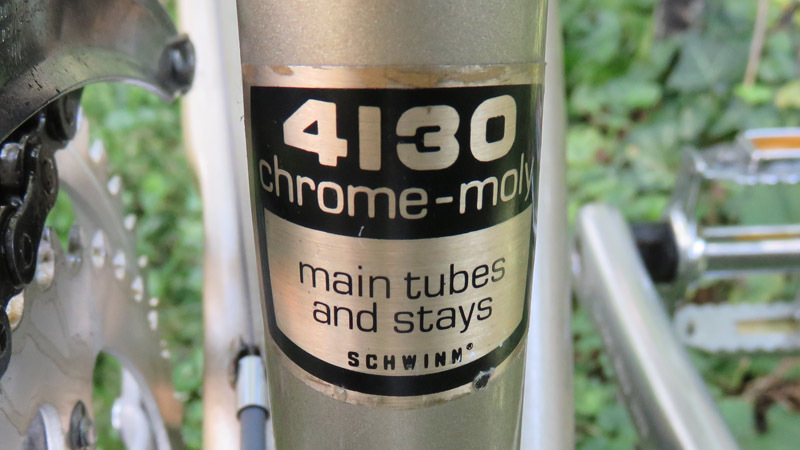 The reason was that Schwinn’s factory in Chicago had become outmoded and was incapable of producing a large number of high quality crome-moly frames (a strong steel formally called chromium molybdenum) common among its Japanese and European competitors. Eventually Schwinn with the 1989 model returned the manufacture of the Le Tour to a small section in its Chicago factory. In the 1978 catalog the Le Tour is still "Schwinn Approved," which means it was made in Japan or Taiwan. 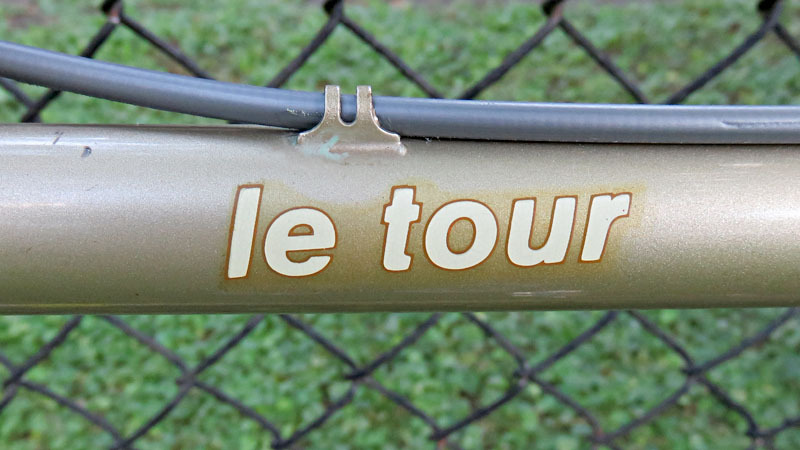 In 1979 the catalog description of the Le Tour refers to a "Made in USA torched brazed lug frame." These Le Tours were likely made in Chicago. However, the factory in Chicago was shuttered in December 1983, so it is doubtful that the 1883 Le Tours were made in Chicago. In the early 1980s Schwinn made the decision to start a new factory in Greenville Mississippi. The factory opened in 1981. The 1983 Schwinn Le Tour I found leaning against the bicycle shed no doubt was among the first Le Tours to be produced in that factory. The design and components of the bicycle are very similar to those that had been imported during previous years. 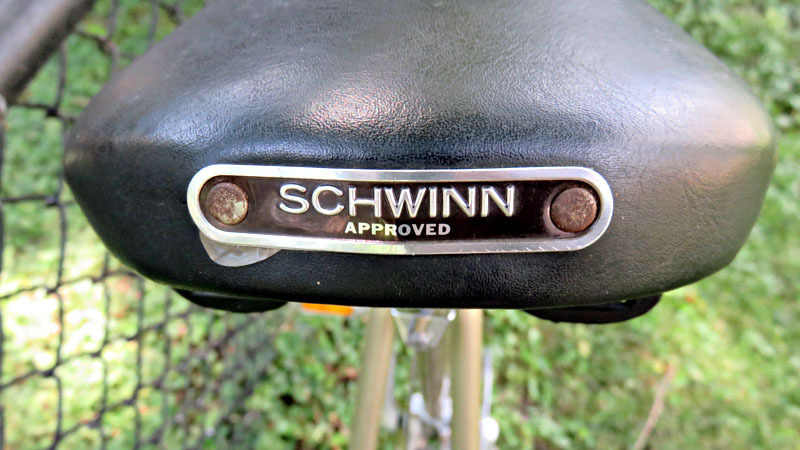 This was a period in which Schwinn was attempting to reestablish its manufacturing identity by returning some frame production to the United States. However, the experiment failed and in 1991 the Greenville factory closed. Bankruptcy was soon to follow. With a Chicago head badge, the 1973 Le Tour could have been made in Chicago, but it's quite unlikely. All indications are that the 1983 Le Tour was manufactured in the new Greenville factory and affixed with a Schwinn Chicago head badge. The 1983 Schwinn Le Tour is a nicely built bicycle with excellent balance. The 1983 model represents Schwinn's attempt to build a high-quality road bicycle in the United States. The bicycle has a mix of Japanese and European components specified by Schwinn engineers. 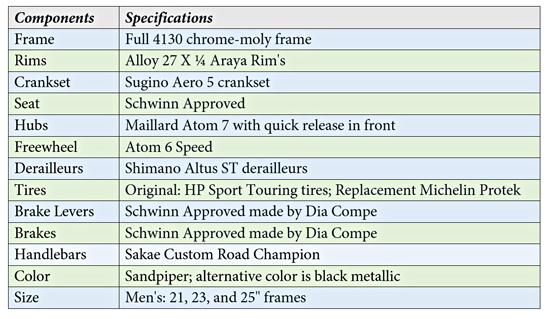 The components range from Shimano shifters to Maillard hubs (table 1). The majority of the components are Japanese, a nod towards the origins of the Schwinn Le Tour as a Schwinn-approved bicycle made in Japan. This model represented Schwinn's attempt to reclaim its industrial "made in USA" past. The frame is made in the USA from 4130 chrome-moly tubing. To my knowledge this frame is not double-butted (thinner in the middle and thicker on the ends). The frame is fairly light as the bicycle weighs in at 26 pounds. Since I refinished this bike, I have ridden it for about 100 miles. The feel of the bike on the road is is smooth, stable and strong. It is definitely designed as a touring bike that can carry the weight of camping gear. 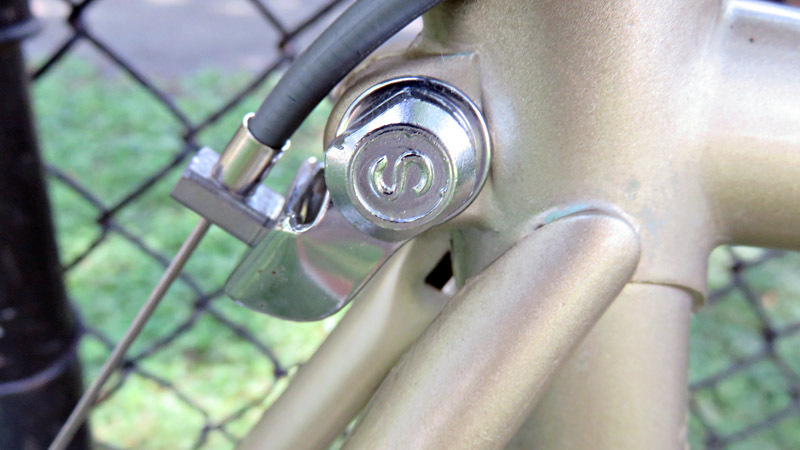 The rear stays and front fork have threaded holes, ready-made settings for attaching racks. The frame of the pictured bike is the largest size made at 25 inches (63.5 centimeters) as measured from center of bottom bracket spindle to top of seat tube. 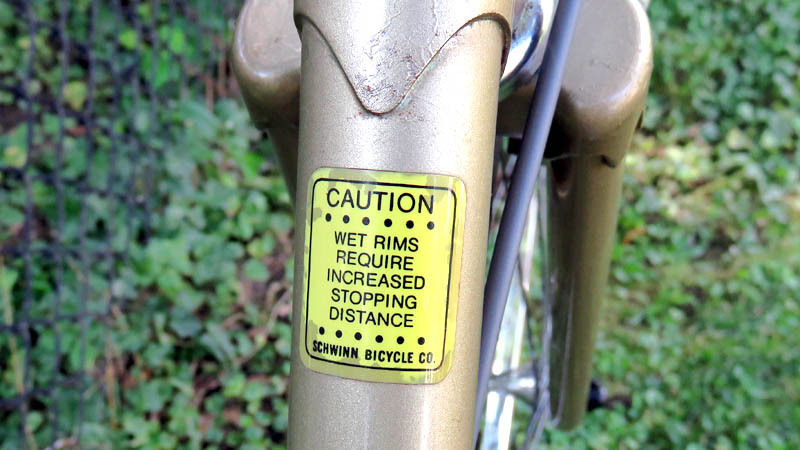 This means that the bike is best sized for someone that is about 6’ 2” (1.88 meters) and above. On the rear dropout there are some clues as to the date of the bicycle. Stamped on the dropout is the serial number SF303719. 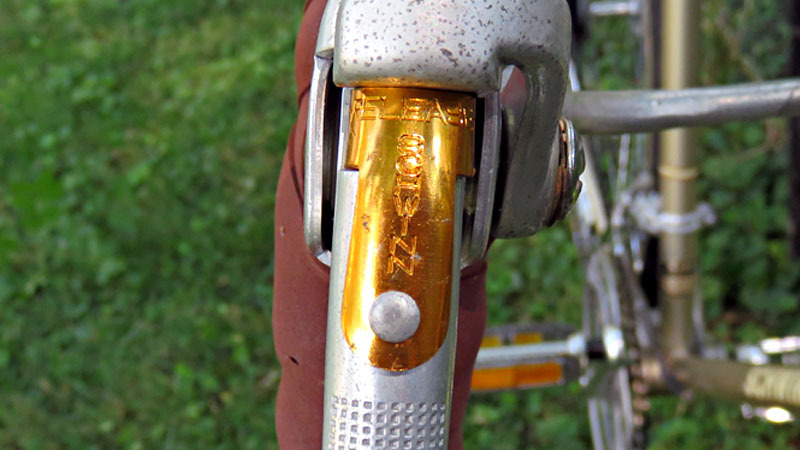 According to Schwinn, models made in Japan usually have a J as the first character in the serial number. The Schwinn Le Tour starts with a letter (S=Le Tour and some other models) followed by the production month (F=June) and then the year (3=83). This means the frame was produced in the USA in June of 1983 with no indication of the factory location. For more information on this confusing serial numbering system, see the official publication Schwinn Information Bulletin No. 23. The derailleur set is Shimano Altus. At the time the Altus was a low- to mid-level derailleur for a road bikes. 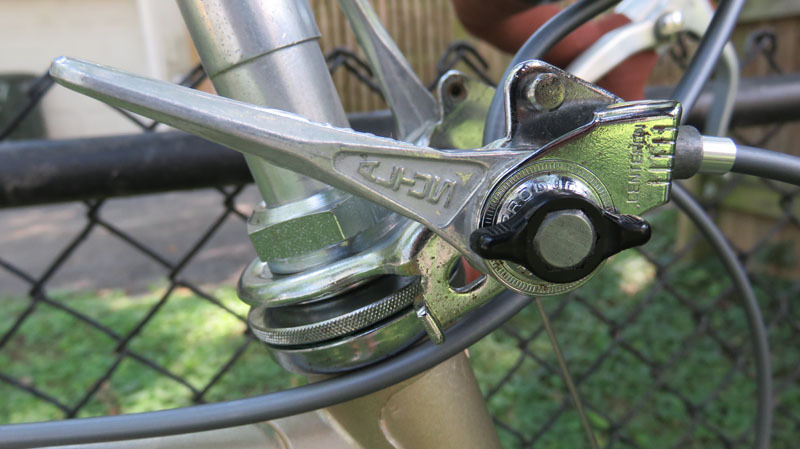 This particular Altus was sold just before Shimano began to sell indexed shifters in 1985. I have no idea when it was introduced, but it must have been in the 1970s. 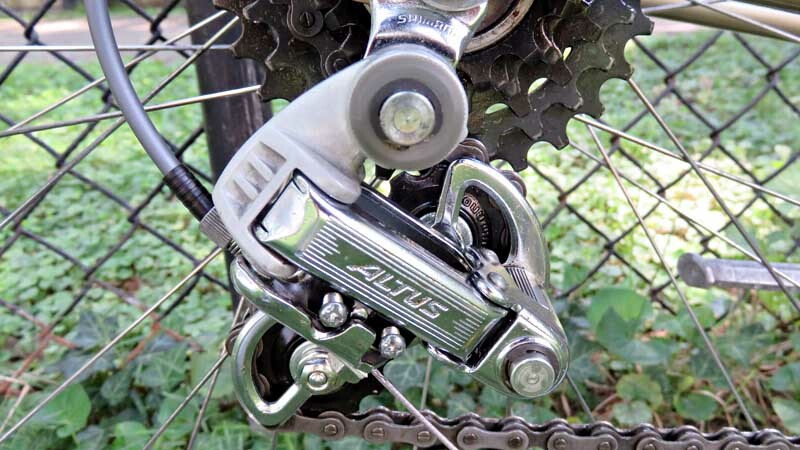 Today the Altus is still a name in Shimano’s line of derailleurs, but it quite different and is marketed for mountain bikes. 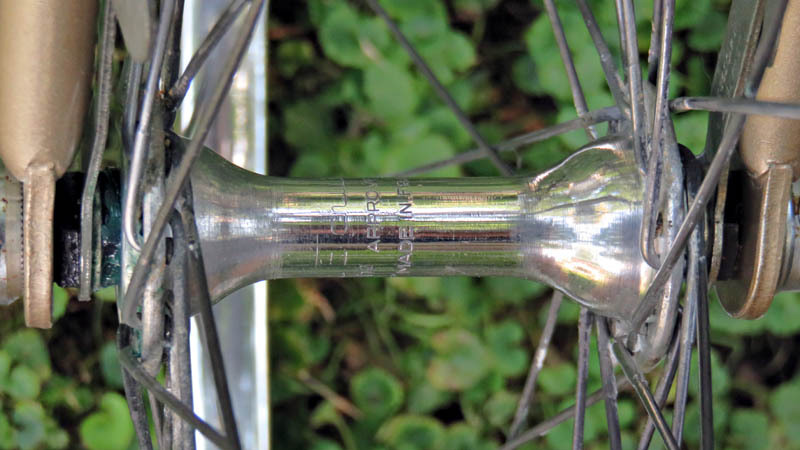 Both the rear freewheel and hub are made in France. The freewheel is a six speed Maillard Atom 77 and the hub also is Maillard quick release. These parts were fairly common for bicycle constructed in 1973, but they were on their way out being replaced by parts made in Japan. The alloy Araya rims are 27/¼” and are made in Japan. 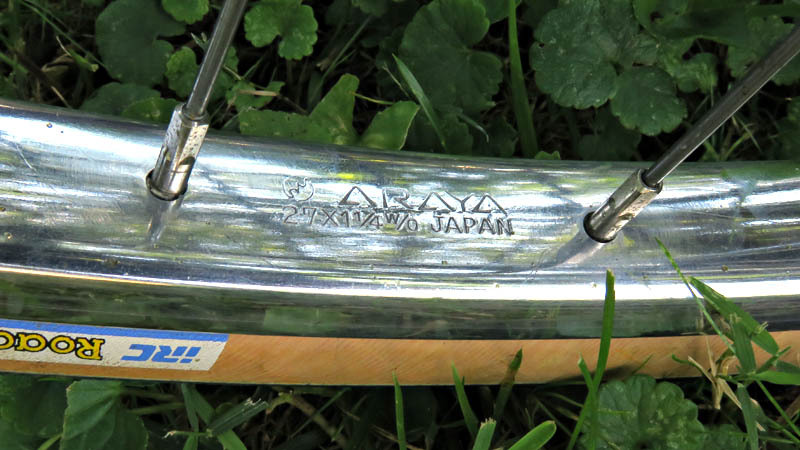 The brakes, handlebars and stem are all made in Japan. The brake levers are Schwinn Approved, but I have an identical set of brakes on another bike (without the levers) and they are made by Dia Compe. The quick release mechanism is so that the brakes widen for removal of wheels. The stem and handlebars are made by Sakae in Japan. The handlebars are Sakae Custom Road Champion. 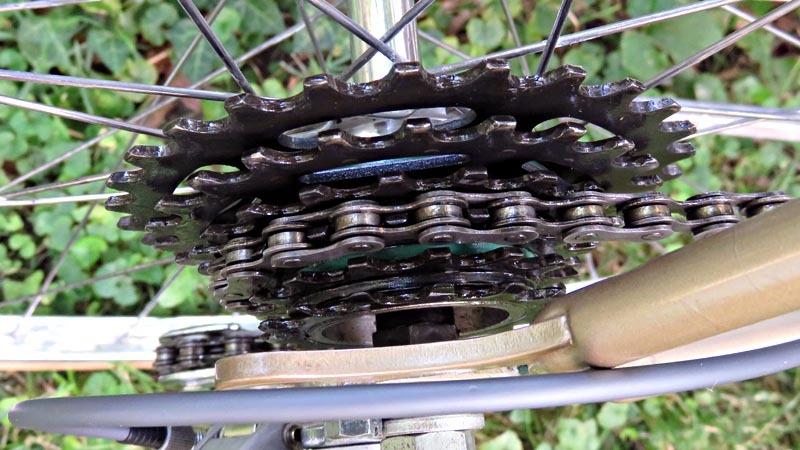 These parts were common on good quality bicycles in the early 1970s. This Schwinn Le Tour is a classic road bike ideal for touring and recreation. 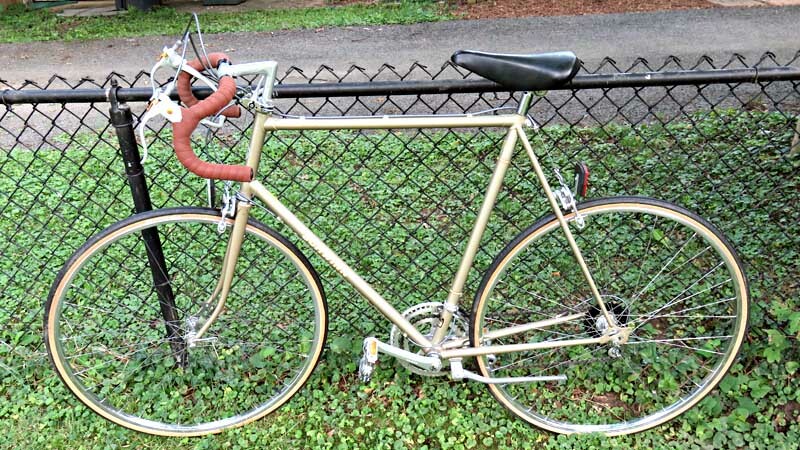 The model was so popular that Schwinn made many different variations of the basic Le Tour, including such models as Le Tour Luxe, Super Le Tour and others. This bike has a smooth stable ride and takes corners very well. The only irritation on my test rides was the old kick stand kept bouncing up and down over bumps. I solved this problem by simply removing it. However, the bike does have a nice built in platform for a kickstand. Overall, this is a great bike and a turning point for Schwinn and the bicycle industry. Selling the earlier Japanese Le Tours, Schwinn was acknowledging that the company did not have the capacity to compete with the Japanese manufacturers. In 1983 the company made an attempt to return production to the USA by opening a factory in Greenville, Mississippi. Unfortunately the move was too little and too late. Due to poor business decisions the company declared bankruptcy in 1992 and was eventually sold to the Zell/Chilmark Fund in 1993. Today the company is owned by a branch of Dorel Industries in Canada called Pacific Cycle. Pacific Cycles markets Schwinn, Mongoose and Iron Horse brands of bicycles. For those interested, I have done similar restoration in the past, and one was my own old 1971 Raleigh Record bicycle. Today I use that bike for riding in my neighborhood and down to the corner store. Due to a stiff back I recently have installed a longer stem and new Shimano brakes and the restored bike rides like new. Because of all the box store bikes on the road, I think the high quality 1970s and 1980s bicycles are better riding than 90 or perhaps even 95 percent of the bikes on the road today. People often shy away from them because of the drop handlebars, skinny tires and lack of suspension. With a few small changes such as a higher stem and thicker tires, these bikes can provide quality transportation at a reasonable price. As evidence, check out any crowded downtown bicycle racks and you’ll always find some of these old timers still providing reliable transport. How many cars do you see today that are older than 40 years and still smoothing rolling down the road? Crown, Judith and Glenn Coleman. 1996. No Hands: The Rise and Fall of the Schwinn Bicycle Company, An American Institution. 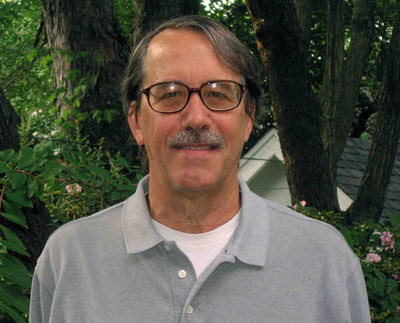 New York: Henry Holt and Company. Note: All pictures in this article are by Doug Barnes 2017. Thanks for the post. Bought mine in 1984 and after all these years the tube markings are gone. Everything else still there though! Same handlebar, chrome-moly sticker, etc... (#SC300132) Wish I could pin down the model for certain, I think it was a Le Tour. According to your serial number (presume it is SC300132) this would be either a Le Tour or Super Le Tour (S) produced in the month of March (C) in 1983 (3). The rest of the numbers are unique. As above the frame is probably produced in Mississippi. Thanks for the article Douglas. Great information and pictures! I'm hoping to be the proud owner of a one owner 1983 Le Tour tomorrow. It appears to be all original except for the pedals and rear brakes. I would like to replace the pedals with the originals. Are they fairly easy to find? Any idea if the Le Tour had it's own style of pedal?